The second generation of Android Wear's first poster child, the Moto 360 2 smartwatch, will be announced as soon as next week, it seems, as Lenovo just posted a teaser with what looks like a watch and the "It's time" slogan. Said time is actually September 8th, and the venue is Shanghai, so that's when the Moto 360 2nd edition is likely to be announced a week from now. As a reminder, we are expecting two versions of the Moto 360 2. Just like with the Apple Watch, they will differ in size - the "S" model should be 38mm with a 270 mAh battery. The larger "L" version could measure 42mm, and carry a 375 mAh juicer. 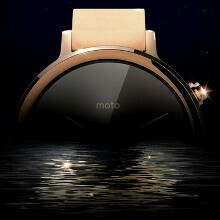 The screen might get a higher 360 x 360 resolution compared to the 360 x 290 resolution on the original Motorola Moto 360. There will eventually be a more rugged "Sport" version at a later date, with a "Hybrid Display" optimized for outdoor use, waterproof chassis, GPS and barometer. Reportedly, the smaller 1.37" Moto 360 "S" would come with a 20mm wristband, while the 1.55" Moto 360 "L" should carry a 22mm one. As for price, release date and other specs or functions, they should all be revealed at the September 8th announcement, so not much left to wait. It will be a hit again in the wearables market. Samsung's decision to go with the tiny 1.2 inch screen in the Gear S2 will only aid its growth. In spite of the public opinion in favour, moto 360 didn't sell well compared to Gear watches. Check IDC figures for 2015 Q2 here:www.idc.com/getdoc.jsp?containerId=prUS25872215 Moto is not in list but clubbed in others. Availabilty may have been one factor, brand being the second. This time Gear watches are much more impressive in looks and may beat these in battery life due to tizen OS efficiency. Looks set for a good competition between Gear and Wear devices. Good looking watch. Only handicap is the battery draining google services. Google should rewrite the Wear OS by removing the battery draining doemon threads from the Adroid OS. might just go for it. all depends on the price they launch this beauty. Else, the original moto 360 is still good enough for me. That looks ugly. The original looked good barring the flat tire but that looks horrible. The Huawei watch and gear s2 classic look much better. Is time: for a tire change.